This trailer for Godzilla, the new game from Bandai Namco coming out next month, looks gorgeous and fills me with lust. I am having a lot of feelings right now about the fact that I don’t own a PS4. Today has been an amazing day. Reed and I walked through a gorgeous spring evening to our favorite neighborhood pizza place, sat outside under the oak trees, and followed up some damn good pizza with a special treat; chocolate cake to celebrate the raise I got today! It really is amazing cake. We go to this pizza place all the time, but only buy a slice of cake for special occasions. On the walk back we made friends with a very nice cat who got up from its porch, making a squeaky meow the whole while, then plopped down on the sidewalk direclty in front of us and rolled about for several minutes. We all hung out together on the sidewalk for a bit, then Reed and I continued on our way. I love making friends with funny neighborhood cats. To recap; my employer values me, I had pizza and cake for dinner, went for a lovely evening walk with my sweetie, and made friends with a cat. I could not imagine this day getting any better. And then I got on Twitter and heard the real news. This is a big deal. I said last year that the only thing that could possibly redeem Legendary’s Godzilla would be a resultant revival of the real Toho franchise. They’re pulling in amazing people, like writer/director Anno Hadeaki of Neon Genesis Evangelion, and special effects head Shinji Higuchi, a respected SFX supervisor best known for his work the Heisei Gamera series in the 1990’s. My brain is having issues processing the true depths of this awesome. Head to Skreeonk.com for more information. 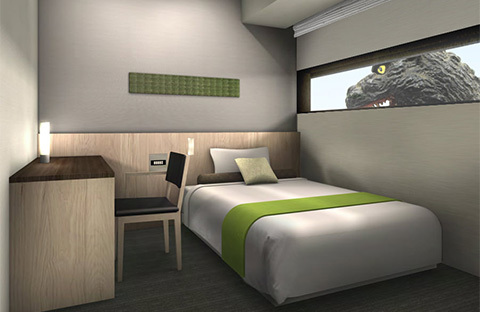 The Gracery Hotel in Tokyo is soon to open Godzilla-themed rooms at their location sitting atop the Toho Cinema. And they look really cool. 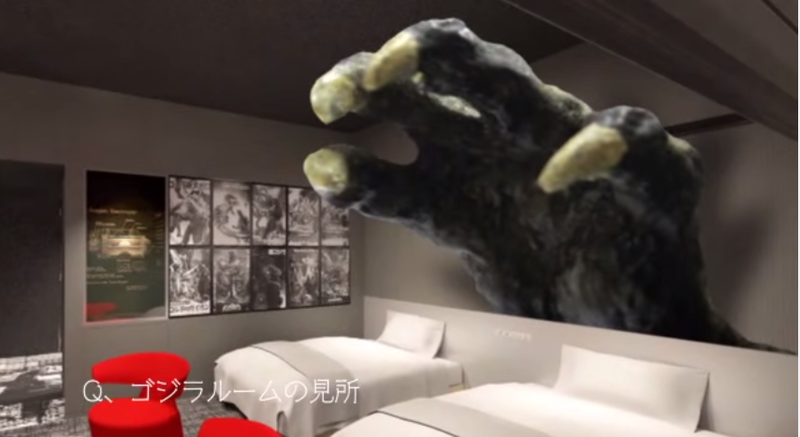 The Godzilla Room includes a giant claw reaching out of the wall and clutching menacingly towards the bed. According to Kotaku, prices will run about $334 US (39,800 yen) on weeknights and $417 US (49,800 yen) on weekends. I really am a little blown away by this. Based on everything I have heard and read, Godzilla’s popularity has waned significantly in Japan over the last decade. For all its flaws (its many, many flaws), if the 2014 American Godzilla film has reinvigorated the Toho franchise and its ridiculous glory, I may have to forgive Legendary Pictures. Maybe. And of course I will be adjusting my projected budget accordingly for that trip to Japan I keep fantasizing about. I am really loving this new IDW miniseries, Godzilla: Cataclysm. It’s a post apocalyptic story of life after giant monsters tore down civilization. It’s only four issues, but I find myself hoping that IDW decides to play more in this world. Post apocalyptic fiction AND giant monster fiction? It’s like writer Cullen Bunn‘s muse decided to mix up my very favorite things! Dave Wachter‘s art is fun too. The monster battles thus far are well choreographed and executed, which I bet is hard to do with (spoiler giant plant tentacles>). If you’re into either great kaiju comics or post apocalypse stories, I highly recommend picking this book. Issues 1 and 2 are currently out. Behold the glory of the Poster Posse’s ‘Godzilla’ fanart project, an interview with Nathan Edmonson, writer of the Marvel comic Black Widow, NASA made a time-lapse video of the unending freak hell winter of 2013-2014, a new Austin-based magazine published my friend Michael Walker’s poetry, Zapier has some great advice about video and email marketing, the shocking revelation that at least one entire demographic doesn’t ‘get’ the most recent Aronofsky film (Noah), and Michael Bay has excavated yet another of my childhood memories from its cold grave in order to create a monster of dubious purpose and quality. Velvet Dust is an online, Austin-based quarterly magazine dedicated to the arts and the community. We explore art, fashion and culture through editorials, design, interviews, video art, and other forms of digital media. We are dedicated to emerging artists and to providing a platform for quality work from up-and-coming talent, both in Austin and throughout the world. Wow. I… I don’t know how I feel about this. I’m a child of the late 80’s/early 90’s, which means I was the target demographic of the original TMNT show. And now Michael Bay, who did what he did to Transformers, has taken hold of another of my very favorite childhood things. Friday is here. To celebrate I am including two anecdotes about my day. A coworker showed up with amazing chocolate cupcakes. This makes me self-conscious because I’m planning to get up early tomorrow to make chocolate cupcakes for my boyfriend’s birthday party (but they’re not traditional cake cupcakes, they’re going to be my ridiculous dark chocolate pumpkin bread in cupcake form). Coworker’s cupcakes have beautiful, perfect, home made frosting in a delightful pink shade balanced with chocolate chips. My frosting execution tends to look like something about to creep, and leap, that one should generally beware of. Anyways, here’s some marketing stuff, an article on how cool volcanoes are, a great podcast on the search for exoplanets and extraterrestrial life, and a return to the dream of the space elevator, which it seems is really going happen, eventually, in the future. Apparently Buzzfeed’s founder hopes that Buzzfeed will be the Time Magazine of the digital era. It isn’t a totally crazy idea. I love this podcast. I may have to pick up Lee Billings’ book. Beautiful video of a huge school of dolphins, and a baby whale cuddling with its mom. I recently started following this blog (thank you, WordPress suggestions box). She’s hilarious, and I need to buy her books. 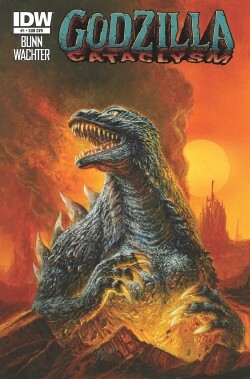 As will eventually be evident in this blog, I have something of an obsession with Godzilla, and kaiju movies in general. Akira Ifukube was the genius composer behind all the most iconic monster themes to come out of Japan in the second half of the 20th century. G-Fest is an annual convention for Godzilla fans that, sadly, I haven’t yet made it to. This kickstarter is funding for a live symphonic concert of Ifukube’s work at G-fest this year. While eating my pizza at the Greek place around the corner that is far too complicated to get too, an older gentleman in an EMT jacket who sported a fantastic white mustache waved and muttered at me in an effort to get my attention. He wanted to look at my t-shirt. Realizing this, I straightened up, moved way from the table, and adjusted my hoodie so that he would have a clear view. “Lovecraft and Dr. Seuss? Right on!” he cried out in the middle of the restaurant. I laughed, excited that someone outside of the convention world got the joke. Especially a random old EMT guy whose visage would have fit into a cowboy movie.